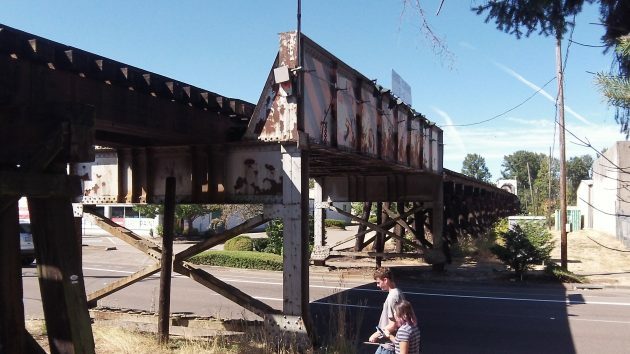 Albany’s First Avenue trestle bears the marks of standing up to countless vehicles taller than 11-4. 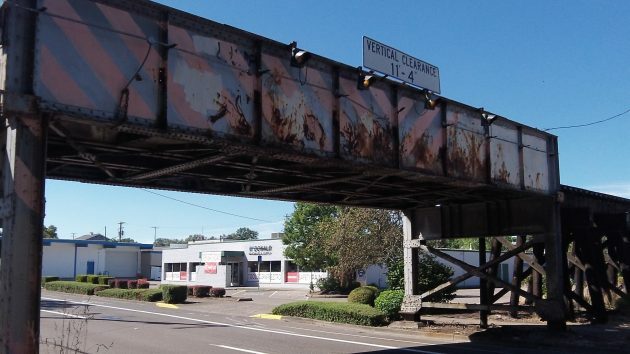 For the first time that I can remember, the Albany City Council has talked about the truck-munching trestle on First Avenue and whether anything could — or should — be done about it. Over the decades, every few weeks or months, the railroad overcrossing at Lafayette Street and First has been chewing up the tops of tall rigs whose drivers failed to notice or heed the signs, lights and warning chains, not to mention the designated detour for trucks. Last Wednesday, Councilor Floyd Collins brought the subject up to his fellow members of the city council, and a brief but free-wheeling discussion ensued. There were various suggestions for additional warning devices, including something that shoots a laser beam across the street at a height close to the 11-4 bridge clearance. When broken by the box of an approaching truck, the beam would touch off maybe a klaxon too shrill to ignore and a sign flashing “STOP NOW!” or something to that effect. But what if there was a crash and the system had failed? City Attorney Jim Delapoer worried about city liability in a case like that. And anyway, he asked, property damage aside, has anyone actually been injured in any of the trestle crashes over the years? No one knew of anyone getting hurt, but there’s always the possibility, isn’t there? There was talk that an elaborate warning system might cost from $30,000 to $50,000. And beyond the capital cost, Councilor Bill Coburn reminded everyone, there’s the continued expense of operations and upkeep. The mayor, Sharon Konopa, put part of the blame on drivers unfamiliar with Albany relying on GPS devices. Could all GPS companies somehow be reminded to advise their users of the less-than-standard trestle clearance? As an alternative, Collins suggested, how about asking ODOT to show the trestle as a problem spot on its TripCheck maps? Transportation systems analyst Ron Irish said he reached out to the Portland & Western Railroad about the trestle but had not yet received a response. One of the suggestions — I think it came from Councilor Rich Kellum — was that the blinking lights at the top of the trestle were hard to see in daylight. The implication was that stronger lights might help. Or how about just repainting the steel structure in some bright color? Unlike truckers, pedestrians can clear the bridge while looking at their phones. For a few years on the internet, there’s been occasional videos of trucks running into an 11’8″ bridge in Durham, NC. They’ve installed signs indicating the height, flashing Overheight lights, and a steel beam to stop trucks from actually damaging the bridge. They’ve pretty much proven the only way to get people to not crash into the bridge is to raise it, but that’s not feasible for them due to buried pipes under the bridge, and the increase in grade it would require for the railroad above. Would lowering the roadway be at all possible here in Albany? It seems notifying drivers that it’s low will only get you so far — the Durham bridge has had 109 crashes since they started recording in 2008, even as the city progressively adds more and more notification. I think repainting it with bright hazard colors like red orange and yellow would be a great idea. Replacing the lights on the trestle with leds of some sort would help too. As it is right now the chains are just about the only warning there is. The lights are very old and practically impossible to see during the day not to mention the odd flashing pattern that doesn’t really grab your attention. With the idea of the laser, it might work to install something that spikes tires like they have in certain places to keep you out of an area or from driving the wrong way. I’m surprised they didn’t impose a “fee” for crashing into it. People were crashing into it before there was GPS. And then we kind of approved of out of town truckers getting wedgies. The good question is “who gets wedged?” Hee. I got caught there once. I know it’ll never happen, but I can dream. 1) The street is clearly marked as not for trucks. 2) There are flashing lights, signs, and chains hanging to alert drivers. 4) The trestle was built and is owned by the railroad. 5) The metal structure seen from the street was installed to take the blow from an over-height truck to protect the actual trestle/tracks behind it. 6) The truck drivers hitting it are absolutely negligent. 7) The railroad isn’t concerned enough to want to raise the trestle to avoid future repairs. 8) The railroads insurance company must not be very ticked off about it. 9) Has anyone heard of serious injuries or deaths from trucks hitting it? 10) It’s clearly an inconvenience to drivers after a wreck, causing them to be detoured and delayed. Is this really a priority over other needs the public worries about? Precisely. We might adopt a Mad Max Road Warrior ethic, forcing unsuspecting over-the-road truckers down 1st St, jamming them up under the bridge. The truck’s contents are stolen and the cops give the truck driver a City violation. Everyone wins. City-wide contest? HH-Today comment section is that …somewhat. No prize at the end for one lucky sole. And that is ok. The politicos do read it. Several add their comments. Thank you! More ideas put forth the better. Who knows, one might stick and make a difference! Looks like you don’t understand constructive problem solving. City staff isn’t the problem. A plebiscite isn’t a solution. Given the problems that need solution, this doesn’t even wiggle the meter. Is there a standard of some kind for this?? How would we get an onboard transponder in a truck from Alberta Canada, or Tupelo Mississippi?